Many parents end up perusing Polka Dot Design, not just for birthday party invitations, but also for starting at the beginning with a search for creativity and unique party ideas. Not to toot our own horn, but we do come up with some pretty incredible birthday party ideas each and every year. For example, one of our recent and now most popular, comes in the form of Gymnastics Party Ideas! Most kids like to tumble around and somersault their way through life, so why not create an entire party dedicated to such an activity? Our gymnastics invitations are truly one-of-a-kind and feature everything you're looking for to host an Olympic-style party of your own. What makes a Gymnastics-style party so darn exciting? Because you're not just providing cake and candy and your every-day-run-off-the-mill children's party games. Instead, your child's friends are able to burn off all that sugar by running around and tumbling their little hearts out. You can really get creative in the process beyond just the gymnastics party invites. With gold medal cookies, awards for the best moves, or even party favors like jump ropes and water bottles, you can really create the right atmosphere for the perfect party. Allowing Polka Dot Design to be your go-to source for all your kid's birthday party invitations, is something we cherish each and every day. We want the invitation process to be a smooth and seamless as possible. This is why we make our invitations fully customizable. From the text color to font choice, even some design and color schemes within the invite itself, we want your invitation to be completely personalized so that you and your child feel like it's a one-of-a-kind representation of who they are. Our invitations are unique, creative, and a special memorabilia for celebrating such a great day. We even take things a step further with our eclectic assortment of invitations and offer you some unique wordsmithing to boot. Our gymnastics birthday party invitation wording is a special tool that you can utilize to make your invite really stand out. Many people don't necessarily keep clever and special invitation wording up their sleeve, which is where we come in. We want the invitation process to be smooth and special, without any hang-ups or delays. We create the wording, from phrases to poems, to simple one-liners, so that you don't get stuck along the way. 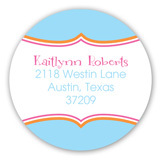 Our gymnastics party supplies don't just end with the invitations, though. 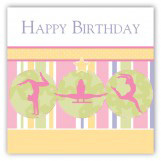 We also feature a wide arrangement of gymnastic-themed notecards, stickers, and address labels. If gymnastics is truly a hobby for your child, then giving the gift of who they are and what they love the most will be the best gift of them all. 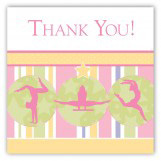 Check out our gymnastics stickers and notecards to complete your child's collection today. 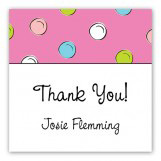 Save up to 25% or free shipping with a Polka Dot Design promo code on Gymnastics Party Ideas or gymnastics invitations online for all of your girls or boys birthday party ideas. For more information contact us at service@polkadotdesign.com or toll-free 1-877-816-0884.